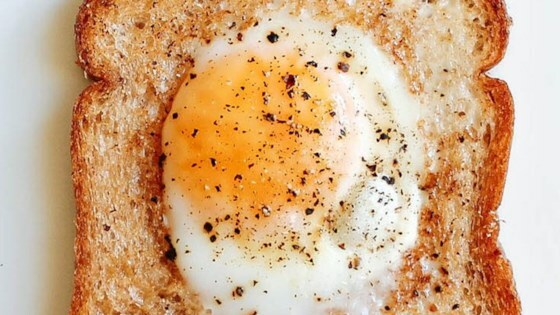 "A delicious runny yolk egg cooked in the center of a piece of toast and eaten with a fork is a great way to enjoy an egg in a slightly different way. My kids feel fancy when eating these." Melt the bacon grease in a non-stick pan over low heat. Cut a 1 1/2 to 2-inch hole from the center of the bread slice; lay in the hot skillet. When the side facing down is lightly toasted, about 2 minutes, flip and crack the egg into the hole; season with salt and pepper. Continue to cook until the egg is cooked and mostly firm. Flip again and cook 1 minute more to assure doneness on both sides. Serve immediately. 5 stars for being easy and tasty. I toasted the holes along side and used them for mopping up the yolk. Might crack my egg a little sooner next time to ensure completely done whites.